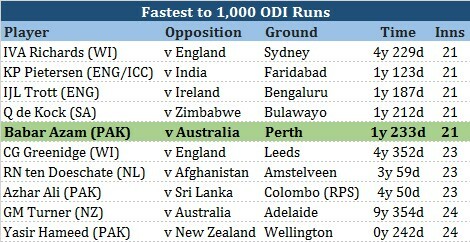 The rise of Pakistan's ODI and T20 teams, which is now ranked number 1, has been phenomenal. From winning the Champions Trophy to clean sweeping Sri Lanka, it has all unfolded with great thrill for Pakistan fans, and all of us are extremely excited for 2019 and rightly so. 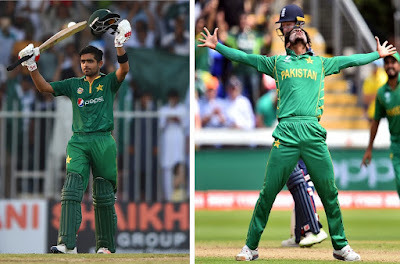 Young blood has truly come to the fore and the rise of Babar Azam and Hasan Ali, coupled with the emergence of new stars like Fakhar Zaman, Shadab Khan, Imam Ul Haq, Imad Wasim, Rumman Raees, and Fahim Ashraf has really set the stage alight for Pakistan's limited overs team. Here is a look back at what Babar Azam and Hasan Ali have achieved for Pakistan in recent times. The career of arguably Pakistan's best limited over batsman ever is unfolding right in front of our eyes and Pakistan's ODI batting has not looked this good since the days of Inzamam Ul Haq, which ended a decade ago. 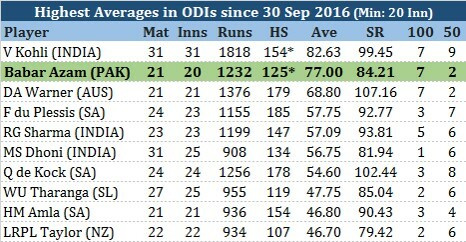 Babar is currently ranked number 4 in the ICC Rankings, behind Kohli, ABD, and Warner. 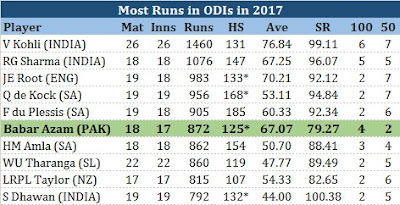 Babar has rapidly risen the ranks and this year he is among the leading run scorers in ODIs with an average and century tally behind only the Indian duo of Virat Kohli and Rohit Sharma. Babar hit his first ODI century on 30 September 2016. Since then he has hit another 6 ODI centuries within a span of 12 months. 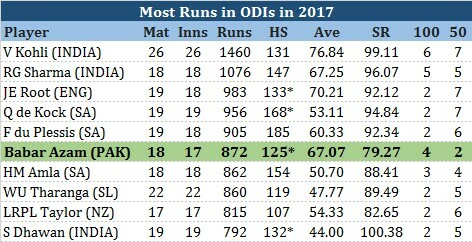 During this period, he has hit the most ODI centuries, equal with Kohli and Warner, and his average is second only to Kohli. 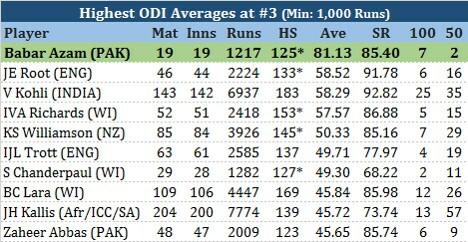 All of Babar's 7 ODI centuries have come while batting at number 3. 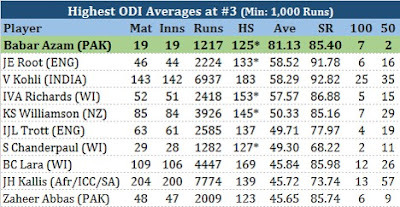 Out of all batsmen who have scored at least 1,000 runs while batting at number 3 in ODIs, Babar has the highest average ever, and he is miles ahead of everyone else. Not only does Babar average better than all batsmen at number 3, he was also quickest to 1,000 runs at the position, breaking the previous record held by Sir Viv Richards. He also got to 1,000 runs in ODIs quicker than any batsman from Pakistan and equaled the world record of 21 innings, which he jointly holds with Sir Viv Richards, Kevin Pietersen, Jonathan Trott, and Quinton De Kock. Babar is only 23 and has his entire career ahead of himself. He can achieve wonders and go on to become the best limited overs batsman ever produced by Pakistan. Since making his ODI debut a year and a bit back, Hasan has risen to the status of being Pakistan's most potent striker with the ball. In just 26 ODIs, he has a tally of 56 wickets at a sub-20 average, and a strike rate of 23. In his last 9 ODIs he has picked up a whopping 26 wickets! 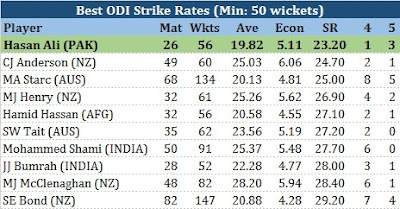 Hasan is currently the number 1 ranked bowler in the world. A feat that no pacer from Pakistan achieved since Wasim Akram was on top in 1994. 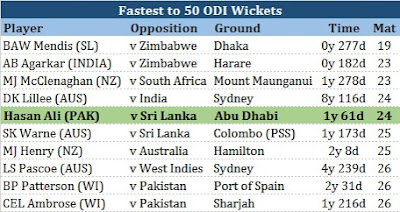 Hasan recently got to his 50th wicket in only his 24th ODI, breaking the Waqar Younis' record for Pakistan of being the fastest to the 50 wicket tally in ODIs. 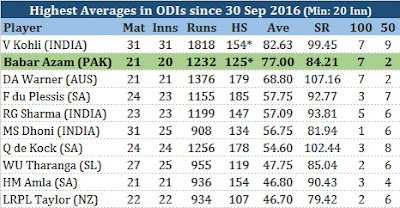 Hasan reached the tally in the joint second fewest number of ODIs among pacers and third overall. 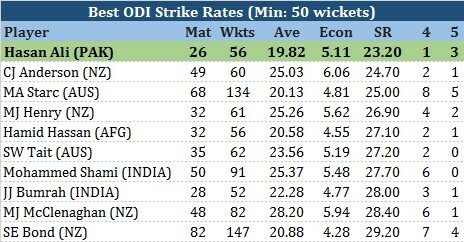 Among all bowlers who have taken at least 50 wickets in ODIs, Hasan has the best strike rate and the best average EVER! Hasan is also only 23 years old and has his entire career ahead of him. Babar and Hasan have a lot to do with Pakistan's recent ODI success. They are on a streak of 9 consecutive ODI wins, which is their third best streak, behind the 10 they achieved in 1990 and their record of 12 achieved in 2008. Both of them can take Pakistan to even greater heights in the future years. Lots of Love for Hasan Ali from India!! All the best! !